Google’s big reveal at their I/O developer conference was their new feature “Now on Tap”, which is a layer that will allow Android’s personal assistant to constantly analyze all of the content on the screen of your phone, in order to search for related data. This new feature will allow every platform on your mobile device, from text messages to social media post, to be indexed. By simply long tapping on the screen, your Android device will be able to instantaneously pull relevant data around the information that is being displayed on your screen. Could this new platform change search as we know it, or is it a creepy invasion of privacy? 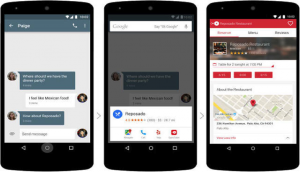 For example, if you are have having a conversation in WhatsApp, trying to decide where to meet a friend for dinner, by long tapping on the restaurants being discussed, Google Now will be able to provide you with more information and reviews about the restaurant, from an app like Yelp, or can even make reservations for you, using OpenTable. Now on Tap will be able to make recommendations or suggest that are better targeted because of the existing knowledge about the device’s user. Google says “developers need only to follow guidelines for app indexing and deep linking in order to turn up in Now on Tap results.” Now on Tap is not an app feature, but rather a feature of the Android operation system, and perhaps another level to the dominance that Google has over our digital existence. From my personal life I know that I am quick to download new apps to my phone, but, like many, rarely open or engage in them. However, with the assistance of Now on Tap, many of these apps that consumers, like myself, rarely use will gain a new life through search context. Not only is this beneficial to consumer, but also from a developer or brand stand point because of the potential for new and consistent engagements. Although some might argue that this new feature is an invasion of privacy, the potential for brands to stay engaged with consumers, through their applications, opens new doors for marketing opportunities.